“Take a deep breath and hold it for a second. That one is coming from the trees and the greenery and the rainforests all around. You can let it out. Now take a second breath. That second breath is not coming from the rainforests or from the greenery. That second breath — 50 percent of the world’s oxygen — is coming from the oceans. Everything we are doing here today ties in with that.” Nigel Mould reminds us to breathe, to contemplate the oceans, and to contemplate the air we breathe. 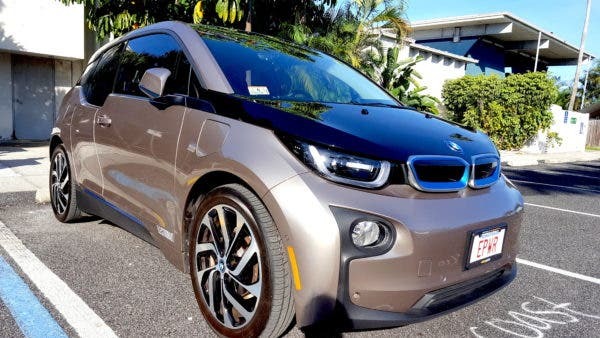 The 6th annual National Drive Electric Week is breaking records with over 200 cities participating. 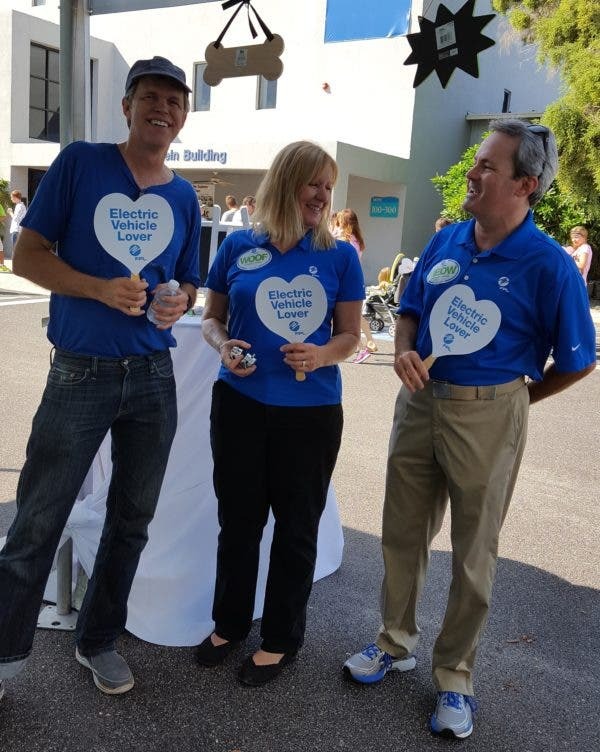 Five years ago, when Sarasota began supporting the widespread event, the city was one of only 29 cities actively participating in this educational event. This year, there were 241 events globally. 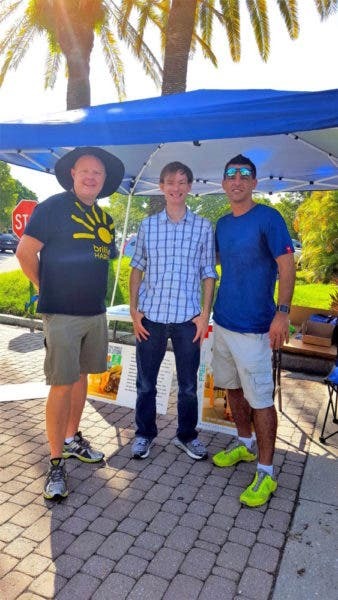 Nigel spoke at the Sarasota event and shed light on a broader variety of environmental matters — such as avoiding the use of plastics. He works as an instrumental natural force at Mote Marine Laboratory and Aquarium. 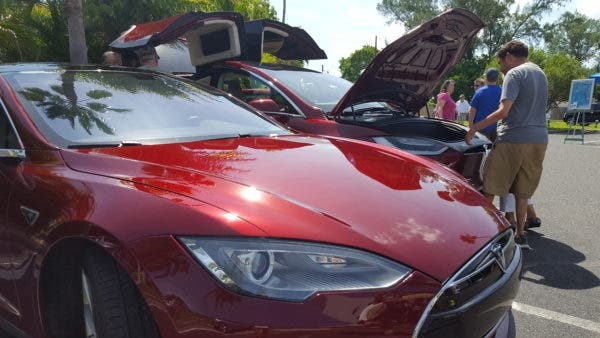 This year’s National Drive Week splashed open brightly on September 10 in the sunshine state. Clean air initiatives so dear to my heart and lungs (and everyone’s, whether they know it or not) routinely find the support of a pleasant crowd of EV enthusiasts. 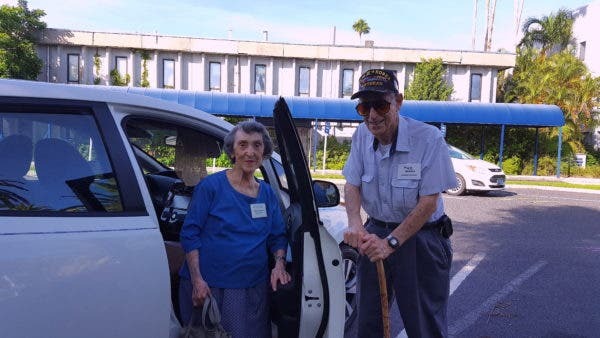 I met some very early EV adopters at Electrify the Island, such as Bernard & Shirley Friedland, a truly lovely and harmonious couple. It was easy to enjoy the kindred spirits of the morning engaged in one positive conversation after another. 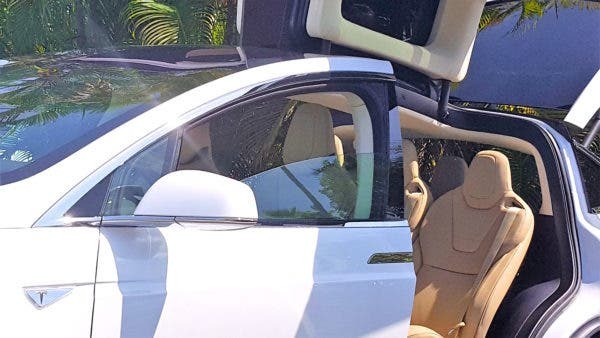 This EV community is such an uplifting one. The event I attended at Mote Marine was an invigorating event filled with an agile flow of common sense. Although a diverse group of folks, I found the attendees actively on the same page. 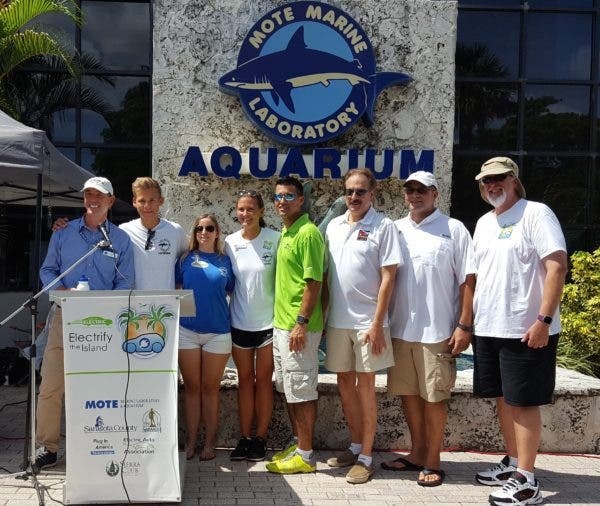 Nigel Mould (Mote Trustee), Tim Decker (Mote Communications Intern), Kaitlyn Fusco (Mote Public Relations Manager), Sofie Wachtmesiter (Mote Marketing Coordinator), Chris Sharek (Electrify the Island Co-Chair and President of Sharek Solutions), Larry Chanin (Electrify the Island Co-Chair), Thomas Harmer (Sarasota County Administrator), Stuart Clifford. Meandering in I met Mark Malkasian, as I did promptly when arriving at the EcoFriendlyFloridaFest. 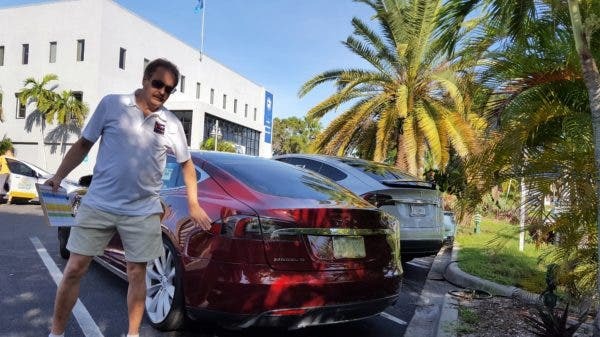 Mike is always prepared to answer a multitude of questions about his Tesla — before you even ask — via his informative signs. Thank you to Nigel Mould, Larry Chanin, and Chris Sharek (yet again) for driving the event at Mote Marine. 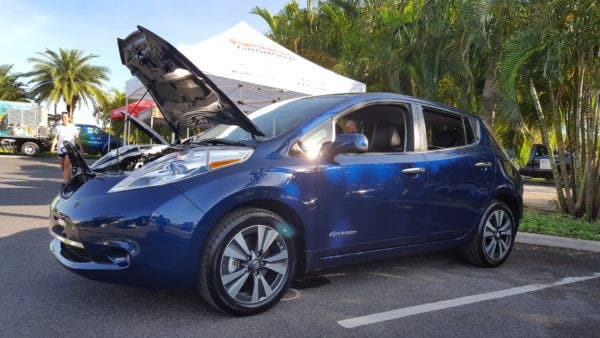 National Drive Electric Day has been going strong for five years in Sarasota, since 2011. 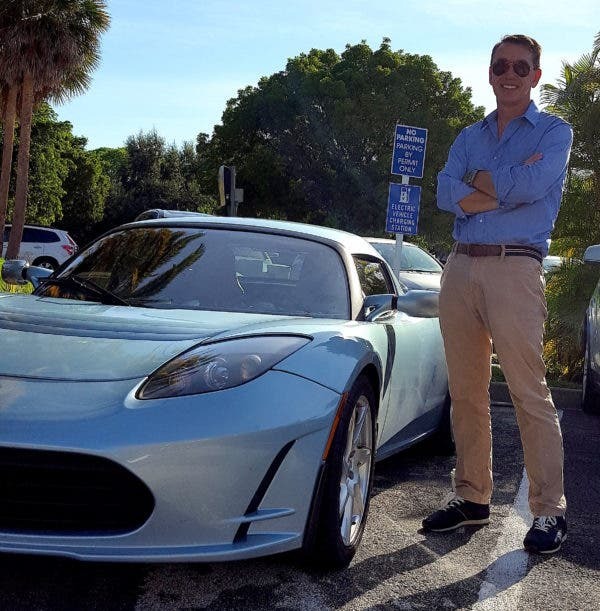 Chris Sharek mentioned that, 5 years ago, we had a choice of 3 different kinds of EVs. Things have changed. 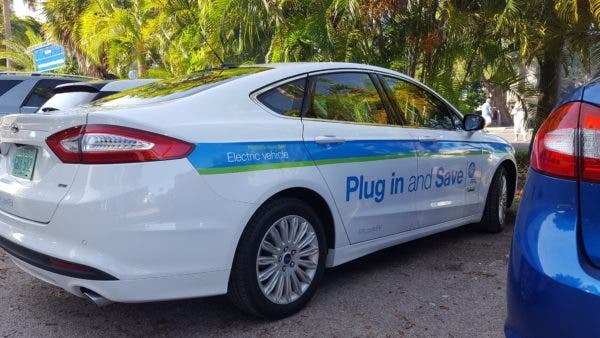 Good things are happening in Sarasota, with thoughtful urban infrastructure supporting EVs. There is one area of pressing concern, however. As a one-time avid bicyclist, I believe Sarasota needs more protected bicycle lanes. Talking to the owner of a Sarasota electric bicycle shop, Michael Weatherby, I was saddened to hear more about the ongoing concern. The city wants to do away with the only adequate bicycle lane on Fruitville Road. Weatherby provided electric bicycles for the event, as well as bicycle policy education. 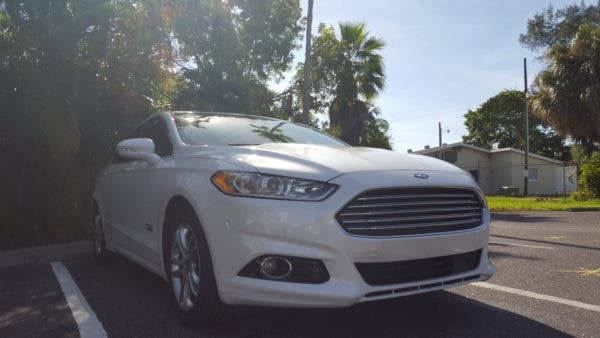 As much as I love EVs, I feel that pedestrians and bicyclists are environmental heroes and are not being given due respect and infrastructure. 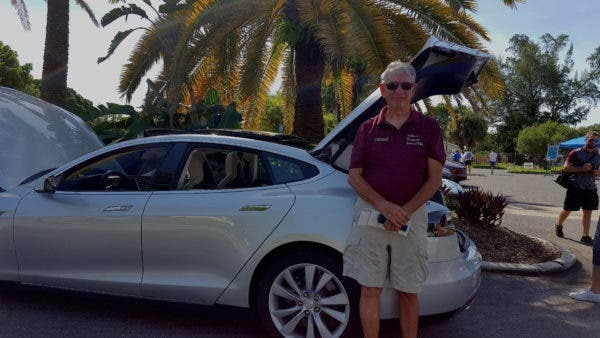 Hendrik with FPL EV enthusiasts. Hendrik was the most exuberant Tesla driver I exchanged EV stories with. He also performed a superb impersonation of Inspector Clouseau (who now drives and charges his LEAF where I do). Bill Johnson of Brilliant Harvest, Tim Decker (Mote Communications Intern), and Chris Sharek of Sharek Solutions. 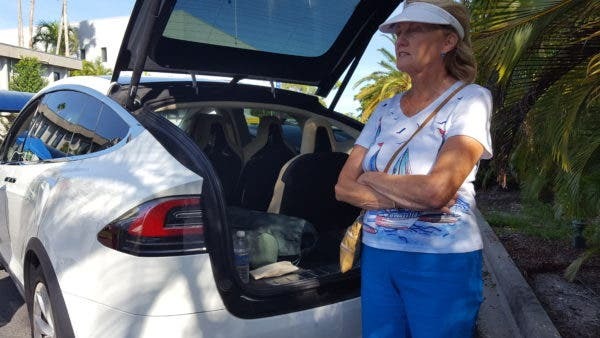 I will be following up with more National Drive Electric Day stories in the coming weeks. Thanks to all of the EV owners at the event whose names I did not get.